The murder of a transgender woman in downtown Oakland in late April has raised several coverage questions since the news broke. On Bay Area news sites that have covered the story, readers have left comments critical of journalists for disclosing the victim’s male birth name. They contend the media should only refer to her by the female name she adopted. And a press spokesman for one transgender advocacy group has asked media outlets to refrain from using the victim’s birth name in stories. A separate question has arisen among LGBT news media professionals on the merits of publishing a photo of the murder victim at the crime scene. It is exceedingly rare for readers of the country’s LGBT press to encounter a photo of a dead body. Unlike mainstream papers and TV stations, many LGBT papers are not monitoring police scanners on a daily basis nor do they have photographers at the ready to to rush to a crime scene. 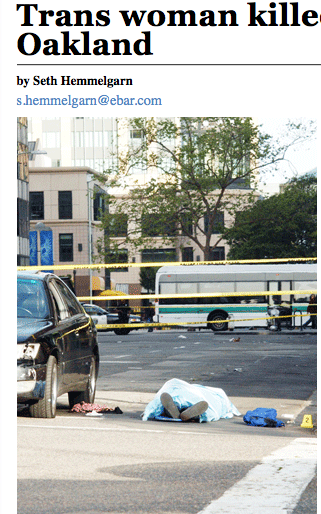 The Bay Area Reporter published a photo (seen above) of the Oakland victim after being sent it by a friend of the person who learned about the killing and rushed to the scene. The paper’s news editor, Cynthia Laird, said she didn’t question whether to publish the photo. As soon as I saw the photos that photographer Tiffany Woods sent me, I knew we had a powerful image for the front page, lead story of a trans woman’s murder in Oakland. Woods, who knew the victim, rushed to the scene, arriving before the coroner’s office had removed the body. At some point, she told me, the police asked her to stop taking photos,” Laird said. Laird added that she believes it is the first time the B.A.R. has run such a photo over the last two decades, as she couldn’t recall using a homicide photo that includes the body in the 16 years she has worked at the San Francisco-based paper. The only other instance that is similar is when in 1998 the B.A.R. ran a photo of deceased AIDS activist Steve Michael in a coffin in front of the White House. It was part of an action that activists did, said Laird. A query of several other LGBT newspapers found few that had run homicide photos as part of their coverage of murders. Bay Windows in Boston Publisher Sue O’Connell recalled two such times her paper did so. We have on two occasions – the crime scene photo of a gay police officer who committed suicide, and the autopsy photos of the SF woman who was mauled by her neighbors’ dogs,” said O’Connell. “We wanted to show the extent of the wound and the nature of the attack. There was a feeling that readers did not understand the viciousness of the attack. I can’t remember how we got them…. Not everyone appreciated it. I find it very difficult to understand why Bay Windows found it necessary to display an extremely graphic photograph of dog-mauling victim Diane Whipple on its front page recently. It seems to me that the words “mauled to death” are adequate in depicting the horrible death of Whipple, and that no visuals are necessary,” wrote the person. Kevin Naff with the Washington Blade doesn’t remember using any such photos in recent years. He said he would have refrained from publishing the Oakland murder scene photo. “I don’t think it advances or enhances the story. Balancing the public’s right to know with the principle of minimizing harm to crime victims and their families is difficult and editors have to make those decisions on a case-by-case basis,” said Naff. Dallas Voice news editor John Wright said that his publisher doesn’t remember using such a photo in the print edition. But Wright has used a similar photo with an online story. “I can tell you that we’ve run one on the blog as recently as a a few months ago when the Iraq emo killings were reported,” he said. Chicago’s Windy City News also has yet to use such a photo in its printed edition. We have not to my recollection; i think it would depend on the news angle of it, so I would never say never,” said Publisher Tracy Baim. While the use of the photo has drawn few complaints, a more heated debate has ensued about how the media should refer to the victim. Friends and former co-workers knew her as Brandy Martell. They claim that Martell, who was shot by an unknown assailant early in the morning of Sunday, April 29, had legally changed her name and Martell was listed on her California driver’s license. But Martell’s immediate family, including her sister and mother, have told the news media that they knew her as Milton Massey Jr. Both the Oakland Police Department and the Alameda County coroner’s office have used that name in describing the victim’s identity. … last night, KTVU (channel 2) News had a report on Brandy with Brandy’s sister which was basically 3 minutes of endless misgendering, calling her repeatedly by her birth name and the sister saying how ‘he’ was still called by his birth name by the parents. It was a huge mark of disrespect to a woman who can’t respond and has lived as a woman since the age of 18,” wrote the person. In the B.A.R.‘s case, it has referred to Martell as a woman and used female pronouns throughout its coverage apart from when quoting police and family members directly. Both the Los Angeles Times and the San Francisco Chronicle have approached the story in a similar fashion. So has the Oakland Tribune. While certainly there have been past cases were the news media mishandled reporting on the death of a transgender person, a review of the press coverage in the Martell case does not point to similar mistakes. Almost all of the stories refer to her as a transgender woman and refer to her on first reference (as well as in photos) as Brandy Martell. Her given birth name is mentioned more as one of the facts in the case, which is how it should be handled. In terms of Martell’s family members, reporters can not force them to use female pronouns during interviews. It is appropriate to inquire why they are using male pronouns or Martell’s given birth name, and those questions likely will be addressed in coverage of this week’s funeral services being held for Martell. Doing anything more would turn the journalist into an advocate rather than a reporter covering the story.